My son-in-law and his father are avid turkey hunters, and John came up with this idea as a birthday gift for his dad. When enlarged to a size usable for a cane handle, it almost looks like a dragon foot or something. The scaling and colors were interesting to me and John approved of the accuracy of the carving and painting. I attached it to a bark-on stick that has some interesting colors and textures. The carving is basswood and I have no clue what the stick might be! It stands 41 1/2” tall. Thanks for looking! really cool cane and fabulous carving. Great job you are right it looks like a dragon’s foot. I seriously can’t tell which one is the real one. Funny, ugly and very nice woodcarving. I like the project from the woodcarving aspect but I wouldn’t like to hold it as a walking stick. Very good job. Very cool and a little creepy. I don’t mind shooting or eating turkeys but I don’t think I want to hold hands with one. 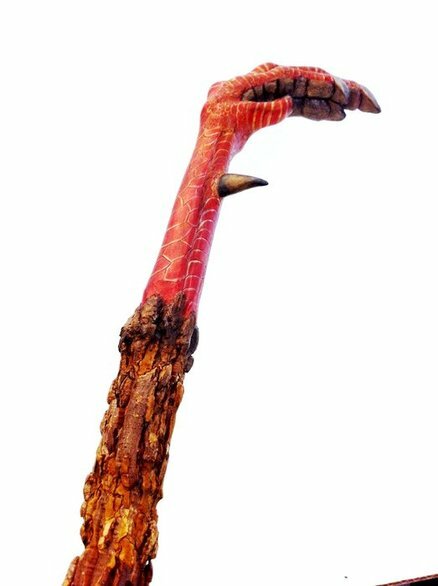 Lovely turkey dragon foot cane! Your attention to details is awesome. That is very interesting ! Nice carving ! great job. i love it. its now in my favorites. Cool cane handle! Excellent carving on that interesting design. I bet he loves it. sweet ! great project posting. one of my favorites.